Hi, As soon as I saw the colors over at The Color Throwdown, I was inspired to play along. I have been wanting to use a new stencil that I got from SSS for a while now and thought it was the perfect time. I got out my Dylusion spray (from Ranger) which just so happens to be the perfect color Fuschia to match the photo. Then I decided I would divide the panels for added interest. It was still missing something, so I added the black inlay FRIEND using my MFT letters. I finished it off with a couple of MFT flowers, sequins, and a sentiment from Whimsical Stamps. You will be seeing this stencil again in a few days! 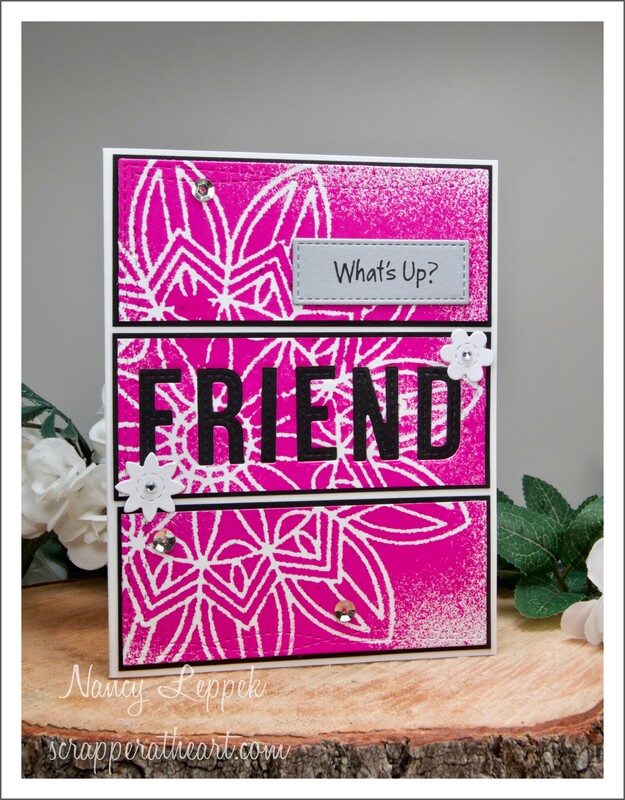 Categories: Cards | Tags: Card making, Cards, friendship, illusion spray, my favorite things, rubber stamps, stamping, stencils | Permalink. This is so gorgeous Nancy. Wonderful colors. I think I would have had a hard time with these colors. You, my friend, knocked this out one of the park. Love that you used the fuschia as the predominant color and the others as accents. Splitting the design was genius. I’ve never used sprays, Nancy, but it worked beautifully with the stencil. The black frames and inlaid word add a lot of impact. So pretty. Love how you used the spray with the stencil. It is the perfect color and I like how you split it in thirds with the black matting, and inlaid work. The little flowers and sequins are great additions. Inlaid word (not work). ha! 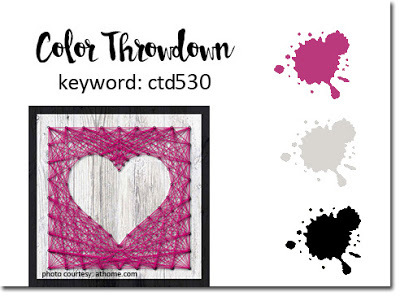 Wow, this is such a striking use of the throwdown colors and I love that you divided the design! Thanks so much for playing along with us at CTD!